File - In this Aug. 15, 2016 file photo, Assemblyman Joaquin Arambula, D-Kingsburg, speaks at the Capitol in Sacramento, Calif. The California state lawmaker has been arrested on suspicion of child cruelty. Fresno Police Department Lt. Mark Hudson said Tuesday, Jan. 11, 2018, that Arambula of Fresno was arrested on suspicion of a misdemeanor charge of willful cruelty to a child. The Fresno Bee reports Arambula was cited and released Monday. 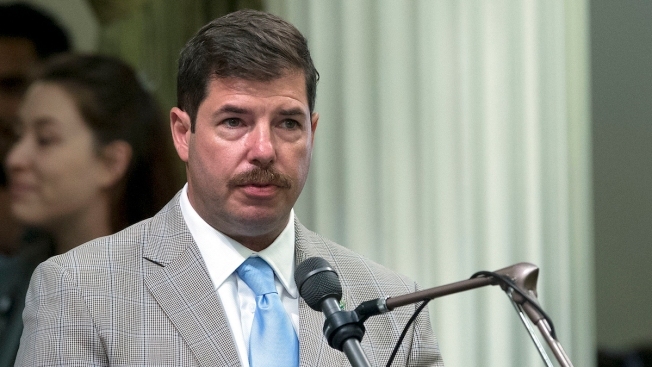 California state lawmaker Joaquin Arambula was arrested Monday on suspicion of misdemeanor child cruelty, Fresno police Chief Jerry Dyer said. Arambula, a Democratic state assemblyman, is married with three young daughters. "Joaquin is a committed father who wants what is best for his children," his spokeswoman Felicia Matlosz said in a Tuesday statement. "He is fully supportive of the process, which will show he is a loving and nurturing father." Arambula is a former emergency room physician who won a 2016 special election to represent part of Fresno and the surrounding rural areas. His father Juan Arambula was a state assemblyman in the early 2000s. Officials at the elementary school reported the child's injury to child protective services, which called Fresno police, Dyer said. Officers called Arambula and his wife, Elizabeth, who both arrived at the scene. The child described how the injury occurred and said Arambula inflicted it, Dyer said. The police determined the injury happened Sunday evening. Arambula was cooperative and cordial, but he did not provide a statement to officers based on advice from his attorney, Dyer said. Officers were "confident that a crime had occurred" and arrested Arambula on suspicion of willful cruelty to a child, Dyer said. He was taken in a patrol car to police headquarter, finger-printed, photographed and then released because his crime is a misdemeanor. The injury did not rise to the level of a felony. All school district employees in California are considered "mandated reporters" under state law, meaning they are required to report known or suspected child abuse. They are not responsible for determining if an allegation is valid, according to the state Department of Education's website. They are expected to report if abuse or neglect is suspected or a child shares information leading them to believe it took place. They are then required to call law enforcement or child protective services, and law enforcement is required to investigate. A physical injury inflicted on a child by someone else intentionally is considered child abuse or neglect. Officials at the elementary school and Fresno Unified School District did not immediately respond to requests for comment.